Argentinean Julio Le Parc’s encounter with Europe’s artistic scene, upon his arrival in Paris in 1958, led to a dramatic turning point in his career. His first experiences showed his preference for the legacy of geometric abstraction, as opposed to the main trends of the day — Informalism, Action Painting, Lyrical Abstraction, including Vasarely’s op art works and Mondrian’s writings, as well as the more radical production of Josef Albers (a well-known professor at the Bauhaus and later Black Mountain College), and the constructivist experiences encouraging a reflection on motion and kinetics. Due to his multifaceted concern with geometric deconstruction, kinetics and viewer perception changes, in 1964 Le Parc began to incorporate mirrors and moving, projected and/or reflected light to reconfigure space and the way it is perceived by the spectator. In all, since the late 1950s he has built a body of work dealing almost exclusively with the relationship between the most radical geometric abstraction and kinetic art, and has organised the various stages of his production according to a sequential methodology, characterised by the introduction of slight variations that eventually have determined his entire oeuvre. Nothing in Le Parc’s work is random or left to chance. 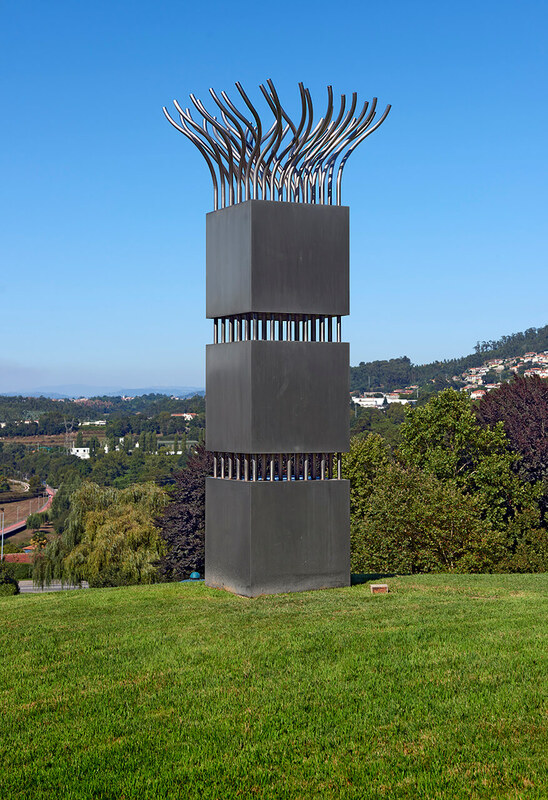 In Santo Tirso, this author built an example of his Sculptures-Torsions — a series of volumetric experiences in public spaces, made up of eminently geometric compositions located at the intersection of semantic opposites: balance/unbalance, static/dynamic, order/entropy. In the case of Ascensão [Ascension], a bunch of slender shapes are held together by three vertically-aligned cubes of stainless steel (chosen for its properties to reflect and diffuse light), and get loose at the top, resembling tree branches waving in the wind. An ascending movement seems to come from beneath the earth, rising up to the sky in search of freedom.